Aloha and welcome to our home away from home in Paradise! The Kihei Kai Nani complex has been a part of our family for over 25 years. You could say that the Kihei Kai Nani and their staff are like our Hawaiian family (ohana). Our ground floor unit (#148, in building 6) is in one of the most requested and desirable buildings in the whole complex. We've put a lot of care and time into choosing just the right amenities for our guests' comfort and enjoyment. Every year we come back to update and add even more amenities to make it a unit that our guests will want to return to again and again. We hope to have you as our guests real soon! Make sure you check out what our guests have said about their stay. The Kihei Kai Nani complex is conveniently located in South Kihei right across the street from Kamaole II Beach Park, 16 miles from Kahului Airport and minutes away from Wailea, known for it's magnificent golf courses and upscale dining and shopping. Our non-smoking unit is steps away from the large swimming pool, BBQ, and laundry facilities. We have completely furnished our unit with brand new furniture, living room and bedroom curtains, linens, beach towels and chairs, umbrellas, coolers, iron/ironing board, blow dryer, 32' and 40' flat screen TVs, and a newly tiled lanai (patio). We also offer a queen-size Murphy bed, air-conditioning, screened security door, ceiling fans, large closets and a hotel style digital safe for your valuables and/or laptop for added security. The complex also offers free parking and nightly security. Ask about our two other condos that are available in close proximity. Perfect for when traveling with friends or family and want to stay close to each other, but have your own space. If reservations are cancelled 45 days or more prior to check-in, you will receive a refund of your deposit minus a $50 cancellation fee. If reservations are cancelled less than 45 days prior to check-in, you will be charged a minimum of 4 nights (unless unit can be re-rented at the full rate) and the remaining balance will be refunded to you. Cancellations of 14 days or less, prior to check-in, will result in forfeiture of all monies paid. The first day of the rental, there will be no refunds for any reason. No credit will be given for shortened stays due to late arrival or early departure for any reason. No cancellations due to weather. Derek is a full-time Captain/firefighter in Oregon. He's been a firefighter for almost 22 years. Tracy is an elementary school secretary. Together we are raising three children. Our oldest daughter is going off to college in the Fall to because a Physician's Assistant, our son will be a junior in high school and our youngest daughter will be a fifth grader. We vacationed in Maui for our honeymoon 23 years ago and have been going back ever since. We take our family there at least once a year and more often if our schedules allow. We love the peace and serenity you find in Hawaii. We co-own the unit with Tracy's mom, Margaret, who owns her own corporation in Northern California. We bought a unit in the Kihei Kai Nani, because Tracy's family has owned units in the complex for over 30 years. 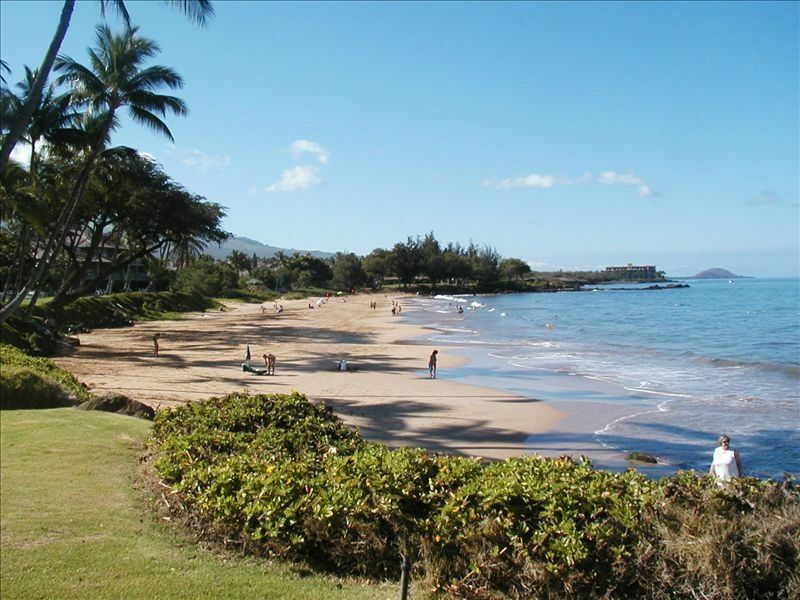 We love the fact that it's right across the street from Kamaole II beach. Kihei is our favorite part of the island. You will enjoy the friendly staff at the Kihei Kai Nani. Our unit overlooks the pool and is located in one of the most popular buildings in the complex. The walk to the beach takes minutes and Kam II is the least crowded of the three beaches across the street. No rocky shoreline--just great snorkeling and swimming. Hotel style digital safe, free parking, nightly security. Well stocked with kitchen supplies, nice and close to the pool and laundry. Nice beach across the road. The condo has everything travelers need for a great Maui stay. It's comfortable and thoughtfully outfitted with beach supplies and a fully functional kitchen. The condo complex is nice, with a good pool and friendly people. The location is terrific-walking distance to restaurants and shopping, and across the street from an excellent beach. Finally, the owners were terrific to deal with-this isn't a corporate manager of lots of condos, but a family who loves Maui and their condo. Thank you Carolyn for the nice review. We are so happy that you enjoyed our unit and we hope that you will consider us again in the future. Love Kihei Kai Nani. Stay there every year. We, wife and two kids, stayed here at the end of our week long spring break trip to Maui. We spent the first 5 nights in Ka'anapli and then the last 3 nights in Kihei. We really liked this condo. It was clean, it was comfortable, everything worked (bathroom/appliances/AC/tv/etc..), and there was plenty of room for a family of four. We really liked that it was literally next to the complex pool which is great when you have two young kids. The kids appreciated that the owner provided beach and pool play toys (boogie boards, snorkeling gear, sand buckets, water guns, floates) and we appreciated the beach gear (umbrella and chairs). My wife appreciated that the laundry facility was right next to the condo and that the owner even provided detergent. We really enjoyed playing at the amazing beach (Kamaole II) that was just across the street. We are so happy that you enjoyed our unit. We try very hard to make it a "home away from home" for our guests. We hope to have you as guests again in the near future. Beautiful Condo! better than advertised! This was a great place to enjoy our stay in Maui. The condo is beautifully updated and furnished! This ground floor unit with easy access had everything to make our stay comfortable. The kitchen has everything even a selection of spices. And the Murphy bed is so comfortable much better than a sleeper sofa!! Tracy has thought of everything and allowed guest the use of so many more things than expected...beach chairs, umbrellas, cooler ..... etc. The beach and park is just across the street and so easy to enjoy and relax. Thank you Sandy! I am so HAPPY that your stay was better than expected. I LOVE hearing that, because we try so hard to please our guests. I hope you will be our guests again in the near future. Rates are subject to change until reservation is confirmed. For stays less than 7 nights there will be a $95 housekeeping fee.